I knew that I was going to pick this book up as soon as I heard about it. I really enjoyed the Lunar Chronicles series, and so I definitely support any opportunity to spend more time in this world. Plus, it’s a graphic novel? Yes, please! 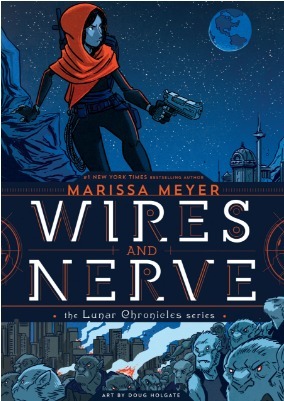 This story picks up a few months after the end of Winter (but before the events of the short story “Something Old, Something New” in Stars Above) as Cinder is trying to navigate her role as Queen of Luna. When a pack of rogue wolf hybrids begin to threaten the delicate peace agreement between Earth and Luna, Cinder sends Iko, the badass android, to capture them. Iko was my favorite character in the original series, so I was especially excited that she was going to be the heroine of this story. She is such a fun, sassy, strong character, and her chemistry with a certain lunar guard is so wonderful. I love seeing her question her humanity and what she knows about love and loyalty. I also really love seeing all the characters from the books. We get to catch up with Scarlet, Wolf, Cress, Thorne, Winter, Jacin, and Kai. I was originally a bit worried that the characterizations would be off in the series. But, I shouldn’t have been. Each of the characters acted exactly as I expected them too. And this story felt like a natural continutation of their lives. “This is Captain Carswell Thorne. He loves three things more than all others in the galaxy. 2. His spaceship, the Rampion. One of the biggest worries when seeing a story you love adapted as a graphic novel is the art. Will the characters look like I think they should? Will I recognize them? But, there is no need to worry here. The art is wonderful. It matches the lighthearted humor that Meyer does so well. The characters look like they did in my head, and the all blue hues are really lovely. The only downside to this story is that I wanted more. Haha. Since its going to be a duology we have to wait a full year to get the concluding volume in this series. But, if Winter is any indication, I trust Meyer to wrap this story up wonderfully, and give my cinnamon roll Iko the ending she deserves! Bottom line: If you love the Lunar Chronicles – this is a must read. I was so happy this series continued especially in graphic novel form. It gave it a relaxed and refreshing view. I wished that there was a little more to the story but I think I may be asking too much. There was Iko, Cress, and Thorne – so I’m good! I wanted more Kai but I guess we will get more of that in volume 2! I totally get that! I definitely wanted a more developed story, but I’m really hoping we get that in volume 2 since this book was mostly set-up. I didn’t even know this existed! So awesome! Hope you get to pick it up soon! Ah! Now I am so much more excited about hopefully picking this one up soon! Thank you for this review! And LMAO that quote about Thorne! Have truer words ever been spoken? I think not! I may have to get my hands on a copy of this book. I want to see if Iko gets her HEA too.